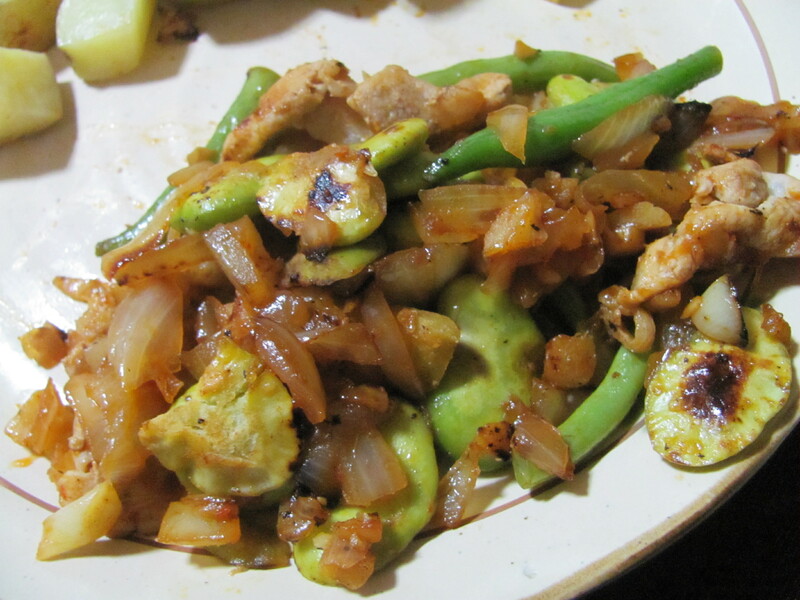 Flexitarian: Spicy Fava Beans and Pork Stir-fry – I'll Make It Myself! Cheruko over at Hokuriku Expat Kitchen sent me Mark Bittman’s New York Times article “We’re Eating Less Meat. Why?” the other day, and we were both pretty excited to see the new term he had coined for people like us: flexitarians, those who eat vegetarian most of the time. That is, my diet is based on vegetables, fruits, whole grains, and beans. I eat dairy, eggs, and honey. I eat fish a few times a week, but I try to limit my fish intake to domestic, locally caught, fish. (You would be surprised how much of the fish at my grocery store is imported from Norway, Alaska, and Chile even though I live on the sea.) I cook chicken occasionally; pork rarely; and beef, never, though I make exceptions for really good hamburgers and Hida beef if the opportunity presents itself at a restaurant. With meat that I purchase, I try to be as conscientious an omnivore as I can be in Japan. Unfortunately, most of the domestically raised poultry sold in Ishikawa comes from Miyazaki prefecture–farther away and the prefecture hit hardest by avian flu in the past few years. Interestingly, Ishikawa is a good source of locally-raised pork, which I discovered when I set out to make today’s recipe. Fava beans, sora mame（空豆), are all over Kanazawa right now (though my vegetable almanac says they are a late spring bean), and they really compliment the sweet onions and spicy pork in this stir-fry. 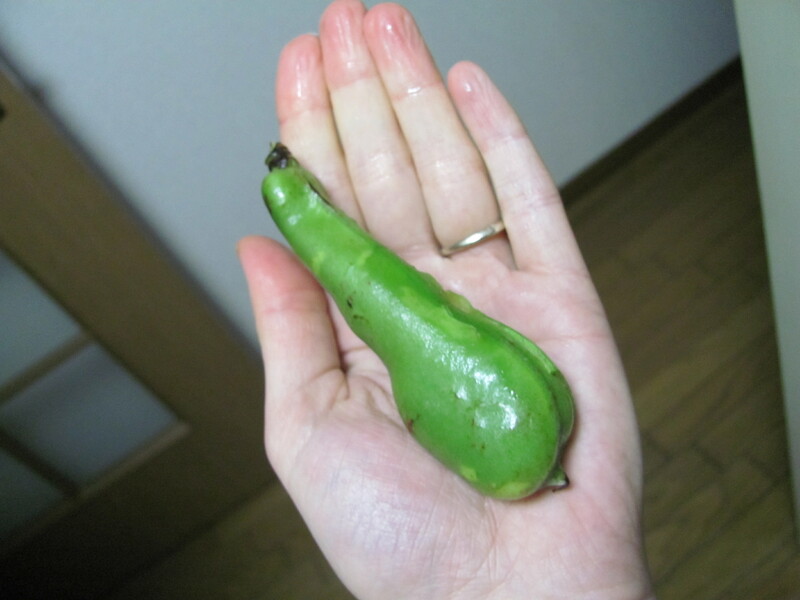 A fava bean pod with two beans in it. The pods I buy tend to have 1-4 beans each. Not a meat-eater? Swapping in more fresh green beans, snap peas, or bean sprouts for the meat. To keep this recipe as a main dish with some protein, ~200 grams of fried tofu (abura-age, 油揚げ), skin on, would provide the umami needed. (Sesame oil provides a lot of umami too, so don’t swap it for olive oil!) If any readers who test out meatless versions, let me know! This recipe cooks up quickly, so be sure to do all the prep-work before you turn on the heat. Boiled fava beans. These need to be shelled. 1. Boil enough water in the pot to cover the beans. Remove the fava beans from the pods, and boil the beans for about 5 minutes or until firm. Drain and rinse in cold water. When cool enough to handle, pick off the shell around the bean and set aside. 2. Dice the onions and ginger root and set aside. 3. Pull or cut the pork into 3-4-cm pieces. (You want them to be bite-sized when cooked but not to burn). 4. Heat the sesame oil in the pan. When hot, add the pork and lightly cook. This should not produce fat drippings, so you probably will not need to mop up the pan. 5. Add the onions and cook on a low flame until they are translucent. Add the garlic and ginger. 6. Add the fava beans, any other optional vegetables, and dashi. Heat the fava beans through on a low flame. 7. Add the bean paste, ketchup, and soy sauce, and mix to coat. 8. Turn the heat up to medium and cook until the liquids reduce and the beans and onions get light scorch marks. This really helps the flavors pop. Taste and adjust the sauce with more chili bean sauce, ketchup, or soy sauce if desired. Serve hot on top of brown rice. Goes well with miso soup with greens and green onions. *Sold with the Asian (Chinese, Korean) spices and pastes in the grocery store. This looks really good. 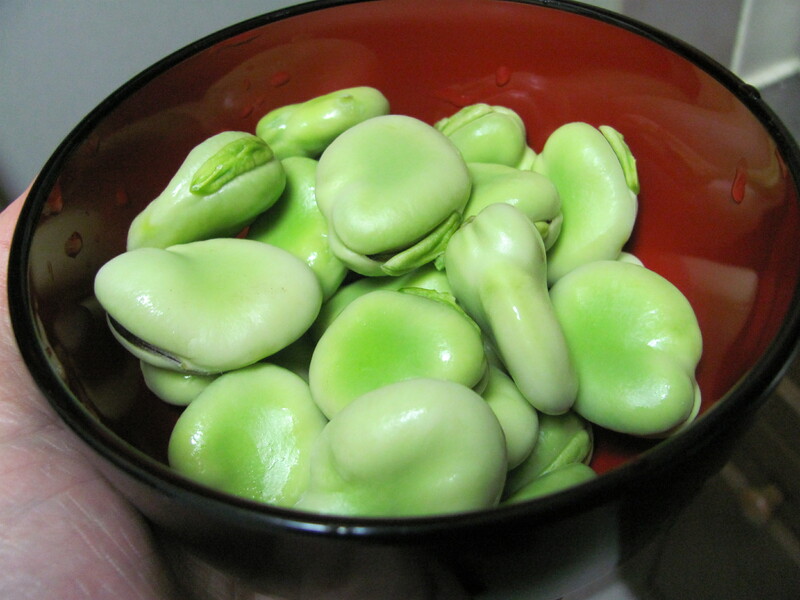 The supermarkets are full of broad beans right now and there is only so much soramame gohan one can eat. It’s great! The flavors all work really well together, I think, and it’s nice and spicy. Pingback: My Favorite Bamboo-Shoot (Takenoko) Recipes « I'll Make It Myself!